This post was sponsored on behalf of Post Cocoa Pebbles. All photos, opinions and recipe are 100% my own. 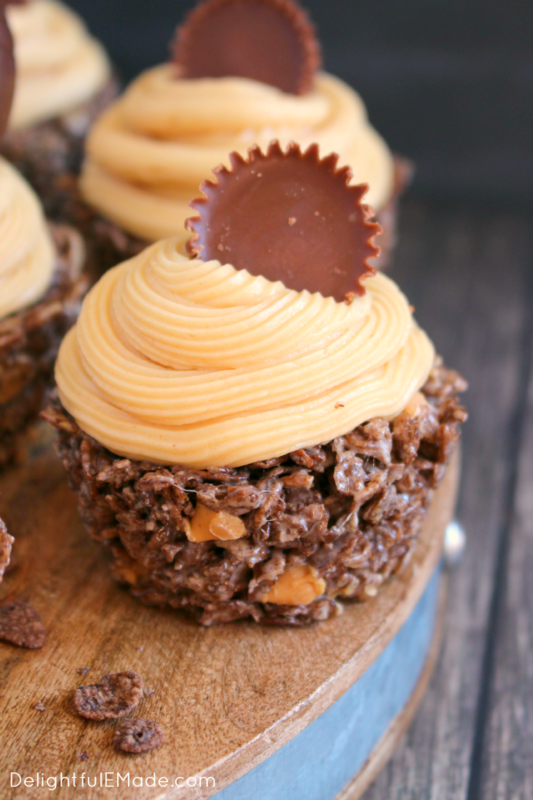 Chocolate and peanut butter come together for the most amazing cereal treats! Cocoa Pebbles are paired with peanut butter chips and topped with peanut butter cream cheese frosting and chocolates. 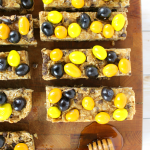 Perfect for tailgating, football watch parties or anytime you’re craving a chocolaty, peanut buttery treat! Whenever we’re watching our favorite football games, I can always go for a sweet treat. 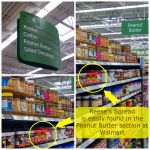 Chocolate is typically at the top of my list, and when it’s paired with peanut butter, well….there is no stopping me! I made these yummy Cocoa Pebbles Peanut Butter Cupcakes for a yummy snack to watch football today, and they were a huge hit with everyone! 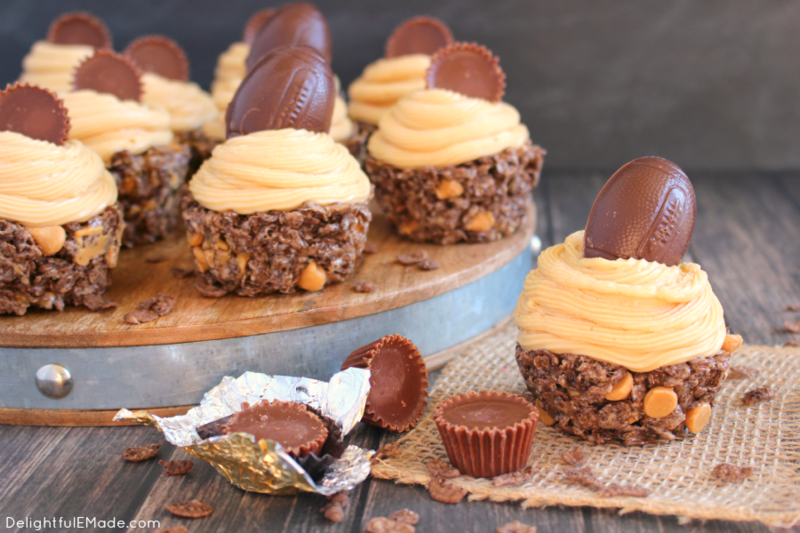 The base of these delicious cupcakes are essentially Cocoa Pebbles cereal treats with the addition of peanut butter chips that I placed in a cupcake pan to take the shape of a cupcake. I absolutely LOVE making fun cereal treats, like my Funfetti Frosted Fruity Pebble Treats as they are such a fun, easy snack that everyone loves. 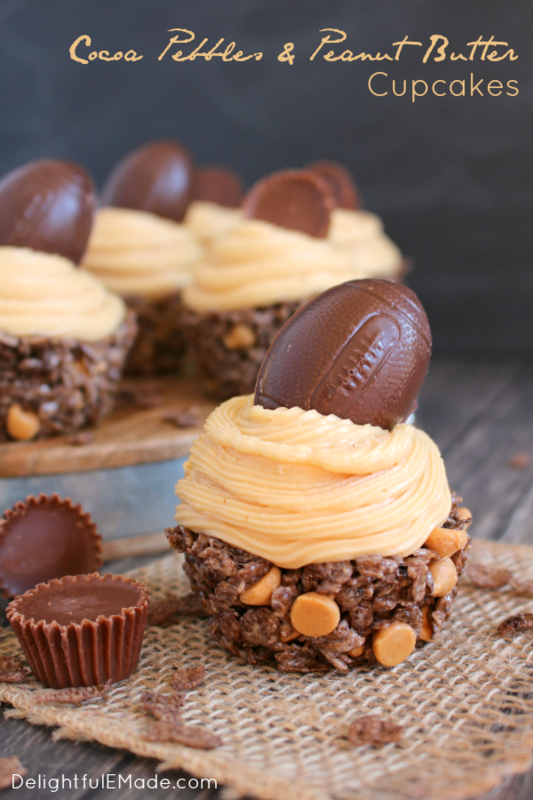 Pairing the delicious chocolate flavor of the Cocoa Pebbles with the peanut butter cream cheese frosting is a home run, or in this case, a touchdown!! 😉 I topped the cupcakes with these cute football shaped chocolates, which are perfect for a football watch party, Super Bowl party, a fun tailgating event or even a kids football themed birthday party! 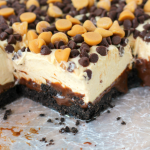 You really can’t go wrong with chocolate and peanut butter! 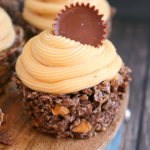 You can also top these fun cupcakes with mini peanut butter cups. 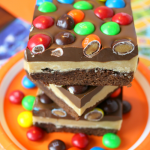 These are a great addition and compliment the chocolate and peanut butter flavors perfectly! 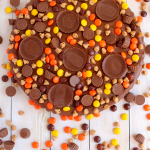 Chocolate and peanut butter come together for the most amazing cereal treats! 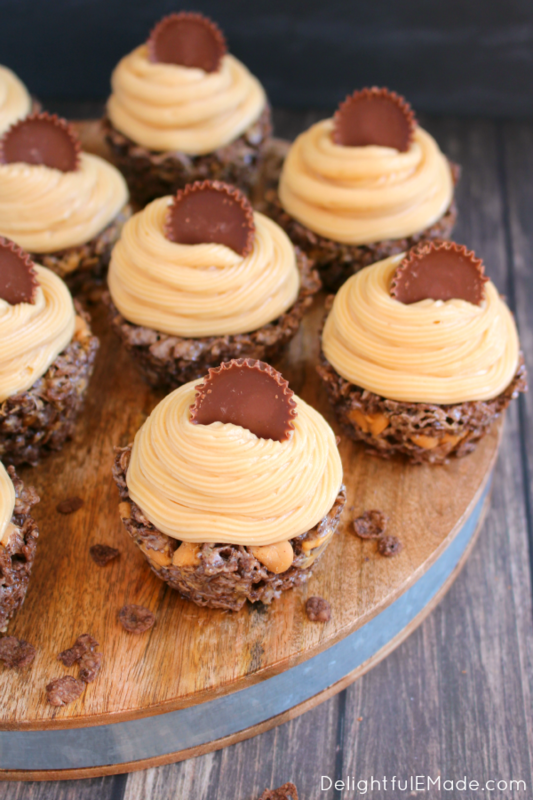 Cocoa pebbles are paired with peanut butter chips and topped with peanut butter cream cheese frosting and chocolates. Perfect for tailgating, football watch parties or anytime you're craving a chocolaty, peanut buttery treat! Generously spray a 12-cup cupcake pan with non-stick cooking spray. Set aside. In a large microwave safe bowl, melt the butter. (Microwave on high for about 45 seconds.) Add the marshmallows and toss in the melted butter to coat. Microwave on high for 45 seconds. Stop to stir, and then microwave for another 45 seconds. Marshmallows will be melted and smooth. Stir in the 6 cups of cereal right away. Continue to stir until all the cereal is completely combined with the marshmallows. Stir in the peanut butter chips. Immediately spoon into the cupcake pan, and press the cereal into each cup. Let the cereal treats cool for about 15 minutes before removing from the pan. Frosting: With a hand or stand mixer, cream together the cream cheese and butter. Add the powdered sugar and mix until smooth. Add the vanilla and mix to combine. Add the peanut butter and mix until just combine. Don't over mix. Add the frosting with a piping bag and tip, and pipe on to the cereal treat cupcakes. Top with a chocolate. Enjoy right away. To prevent the marshmallow cereal mixture from sticking to your hands, generously spray hands and fingers with non-stick cooking spray. Oh, wow! I think kids big or small would love these - heck, Santa might! I don't even like cereal, and I want one~ Thanks for sharing this on Throwback Thursday, and I'll be pinning this to our board! Be sure to follow! :) Happy Holidays!